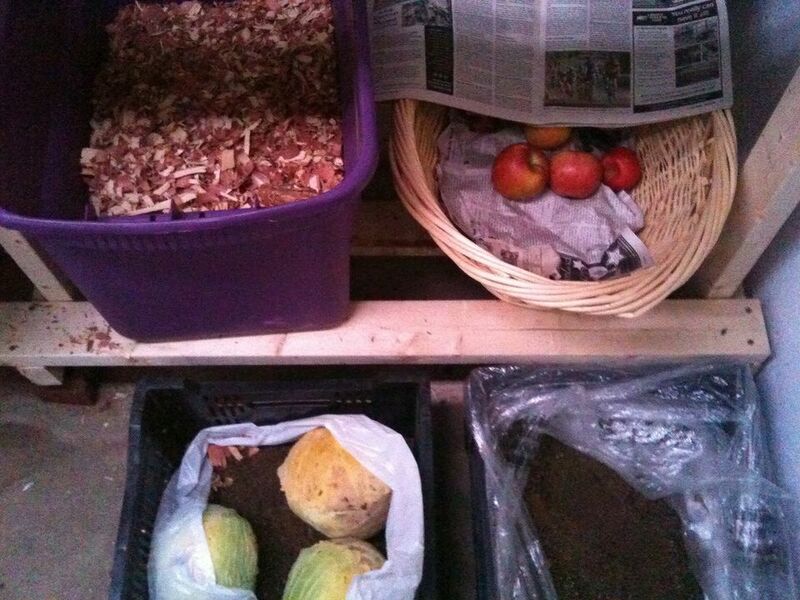 Storing crops in a root cellar is a great way to preserve the harvest. But if you don't have one already, don't despair. It's fairly easy to make a space to store vegetables at the proper temperature and humidity. Whether you're storing food for your homesteading family or selling to customers throughout the fall, winter and early spring, storing vegetables in a root cellar can be a key strategy in small-scale farming. A simple, inexpensive way to store small quantities of vegetables is to use a trash can as a root cellar. You will need to dig a hole deep enough to fit nearly the entire trash can. Buy a galvanized steel trash can and drill holes into the bottom of it (to allow moisture from the surrounding soil into the can). Put the can into the hole, with about three to four inches of it sticking up above the surface of the ground. Plop in the vegetables and secure the lid (you might need to bungee it closed if you have raccoons). Top with a 12-inch layer of straw or leaves and a tarp. If you have a basement, you can construct a root cellar fairly easily. You just need to wall off a basement corner and add vents to allow cold air to flow in and warm air to flow out. Before the temperature drops below freezing, you close the vents, leaving cold air in the root cellar and protecting crops from freezing. Choose a location that includes a window to make installation easy. Masonry walls are best, as they will provide the proper cool temperature—so choosing an exterior basement corner is best. Northern exposure and high soil height on the outside of the corner is also ideal. Replace the window glass with a solid panel to hold your vent pipes. For the vent to let cold air in, consider attaching a pipe that drops to the floor and moves horizontally away from the vent to the outside. Because cold air stays low and hot air rises, this will create a siphon effect where the upper vent draws warm air out of the basement, and the lower vent draws cold air in from outside. Use two by fours to frame the walls of your root cellar and include a door. You will also need to insulate the interior walls of the cellar from the warmth of the rest of the basement. Rigid foam or fiberglass batts work here. Leave a 1/8 inch to 1/4 inch gap between the top of the wall and the joists above it for airflow. If you're a serious homesteading family or a small-scale farmer, you will need some serious square footage to store your food. The basic idea is to use the earth to shelter the food from freezing, rain, and snow. We have seen all kinds of creative solutions—even a school bus buried in the ground! After you dig the hole, you will need some way to keep the earth from falling back into the hole. You can use concrete and rock, or logs and wood. You will need a roof, and perhaps a tarp (which could then be covered by earth to help insulate the cellar). And you will probably want a poured concrete floor and footings that go below the frost line. Key considerations for dug-in root cellars are making sure that frozen, wet soil doesn't expand, which would damage the walls. Drainage is important so that the soil doesn't hold too much water. Exhaust pipes help vent air to the outside. Floor drains are also key, and a 4-inch air inlet at floor level in each room will allow for circulation. Because different crops require different temperatures and humidities, you may want to have several rooms in your root cellar. And those are the basics! You can get very detailed with plans, but these basic guidelines should get you started brainstorming and planning your root cellar. Enjoy your carrots in March!